It started back sometime in the early 90s with a pizzeria on the East Hill. It was the best pizza. In time, Rob and Tony moved down the street to the corner of Main and Strickler. The landlord wasn’t crazy about renting to a pizza place, but the tenant in the video rental place next door vouched for them. Half of Clarence seemed to treat working 6 months in the kitchen as a right of passage. Eventually, Mazia’s became Gianni Mazia’s. And then Rob moved on. This time, he landed at the Cozy Café, tucked neatly behind Monkey See, Monkey Do book store, on the north side of Main Street just west of Sheridan. I can vouch for the lunch, and catering. Try the nutty salad. As for catering, we had chicken, pasta and salad for my mother-in-law’s 80th birthday. It cost less and was higher quality than any other option we researched. Rob dropped off the food himself and greeted our son, a former employee, warmly. The pasta was the highlight, especially the sauce. Well either that, or the homemade salad dressing or the bread. I am certain I first remembered it from many years ago on the other side of town. 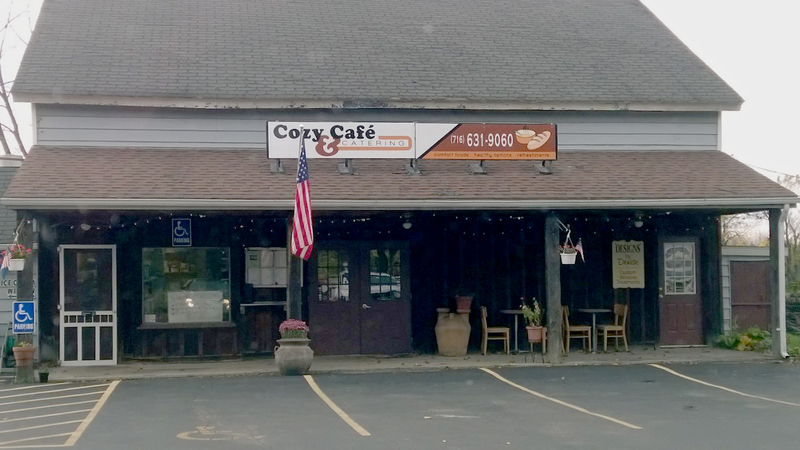 You can learn more at Cozycafeandcatering.com.